October ushers in many things that I love and one of those is breast cancer awareness month. It is said that 1 in 8 women will be diagnosed with the horrific disease. 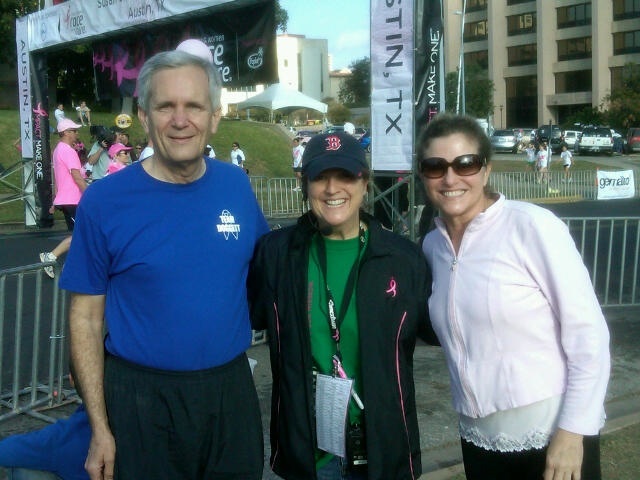 One of my life’s greatest blessings was working as a volunteer for Susan G. Komen for six years. I had the honor of leading the PR committee, meeting some amazing survivors and people who contributed to the cause. 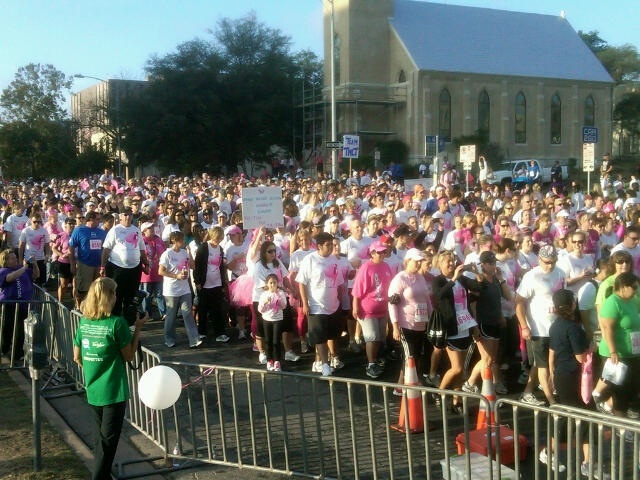 During my time with Komen Austin, we held some pretty cool events that drove awareness and I hope, ultimately lead to saving lives. One of my most memorable events was Bras Across the Bridge. One Sunday morning hundreds of women showed up with bras and lined up across the Congress Avenue Bridge in downtown Austin, Texas, stringing their bras overhead for ‘Bras Across the Bridge’. One year we held a press conference on the steps of the Austin Police Department with the Chief as the lead spokesman. 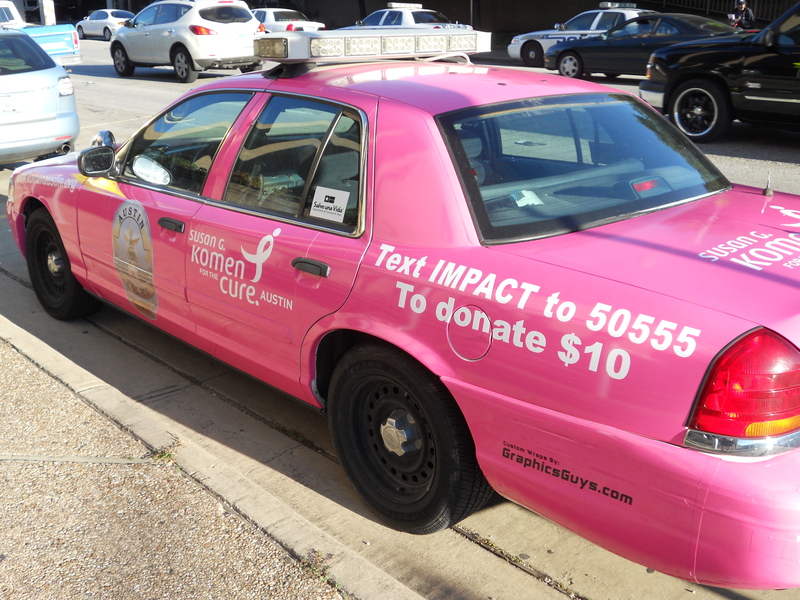 We had a couple of cop cars wrapped in pink. During the press conference we honored survivors who then pinned the APD officers with pink ribbons that became a part of their uniforms for the month of October. My most favorite time came when I put together the race day video and I got to meet and hear the stories of many survivors. One special lady I got to work with was Michelle, she was a wife, a mom, an advocate, and a survivor, and she lead the top fundraising team in the Race for the Cure year after year. Eventually Michelle lost her battle with breast cancer, but not without touching the lives of so many and making a real difference in the fight against breast cancer. Running the show on race day at the finish line stage was part of my role. Every year writing the 30-page script would wreak havoc on me. It involved the securing and scheduling of dignitaries, VIPs, and speakers and timing out everything these guys would say. It was a thrill come race day. Arriving to the site at 4am, setting up, seeing the arrival of the teams and the crowd roll in was nothing short of incredible. 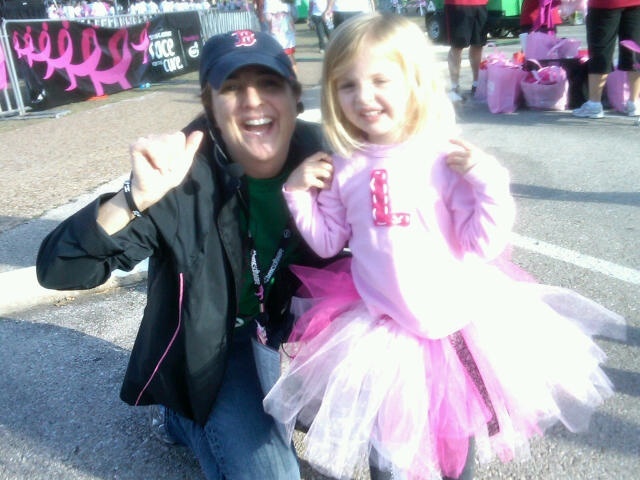 The energy was high and more than 18,000 people would arrive with passion to fight and to take a stand for pink. Mammogram Mixers made their impact. Every Tuesday in October women were invited to schedule their mammograms and mix it with a little fun including spa treatments. It was amazing to see those appointments fill up week after week. I saw the power of this when I got an email from a patient who had put off her mammogram and finally had scheduled it for our mixer. A lump was detected and thankfully they caught it in just enough time.